The big toe joint is a complex joint allowing motion to take place in an up and down direction. This joint is important for the activities of daily living and is critical for athletes in all sports and women who wear any type of shoe with a heel. LIGAMENTS: There are seven ligaments holding the bones together in the big toe joint. Injuries to these ligaments can be mild, causing a joint sprain to severe, causing a dislocation of the big toe joint region. When injuries are mild, localized tenderness, swelling and pain will be around the injured joint ligaments. If the joint is painful to move or weightbear on, it is best treated by temporary immobilization in a brace to allow the ligaments to heal. Isolated ligament injuries usually heal uneventfully. Ligament tears on one side of the joint can cause an imbalance of the big toe. If untreated, the big toe can drift sideways in the opposite direction of the ligament tear. If the big toe goes to the outside, a bunion (hallux valgus) is created. If it turns to the inside, a hallux varus is seen. These usually need to be corrected surgically. Ligament tears around the joint can be severe causing the joint to dislocate. If a dislocation of a joint has taken place the big toe has to be put immediately back in place. Once in place the joint needs to be immobilized to allow the soft tissue and ligaments around the joints to heal. These injuries are often associated with injuries to the joint surface (cartilage) that can cause chronic pain and inflammation of the big toe joint region. Stiffness and limited motion may require aggressive physical therapy to reestablish movement and strength to the big toe joint region. BONES: Chronic repetitive stress or congenital underlying bone abnormalities (bunions) may cause pain in the big toe joint region. Injuries can also occur from direct (blunt force) or indirect trauma (hyperextension injury causing turf toe). These injuries are associated with a progressive loss of motion to the big toe joint. (hallux limitus). These deformities may be mild early on causing symptoms at the beginning of an activity. Usually with activity the symptoms diminish. After the activity the joint may hurt again but over a period of time pain and stiffness become more chronic. The joint will often develop bone spurring on the top, causing difficulty with activities that require extension. Shoe gear also becomes difficult in advanced stages. TREATMENT: Early aggressive treatment of these injuries is critical to allow the joint to assume normal motion without pain, stiffness and swelling. If there are mechanical problems in the joint they may need to be addressed with therapy and occasionally surgery to put the joint back into proper position. If spurring takes place in the joint, early removal of the spurs will prevent further degenerative changes in the joint. Shoe modifications may also be helpful and cleats may need to be modified to prevent further stress to the joint region. Orthotics may be helpful to improve joint motion and prevent further damage. Over time if untreated, joint injuries usually progress, making the long-term prognosis poor. Joint replacements (elderly people) or joint fusions (young, athletic individuals) may be necessary to allow an athlete to resume their recreational or athletic career. CARTILAGE: Cartilage is a hard firm substance that separates the bone surfaces and allows the joint to move freely. The cartilage can wear thin over the years due to irregularities or injuries in the big toe joint. The joint may also become jammed by hyperextending it (turf toe), as often occurs during sports. Repetitive stress over a period of time may cause the cartilage to wear thin and erode. When this occurs, arthritic changes will develop in the joint, causing chronic pain, stiffness and swelling. If the cartilage has been injured it is critical that the joint be rested so that the cartilage and underlying bone have an opportunity to heal. If the injury does not respond to rest, physical therapy, medication and orthotics, it may be necessary to remove the damaged cartilage to allow the joint to move freely. SESAMOIDS: Two small bones are present on the ball of the foot. These bones assist the joint in moving more freely and allow the big toe joint to function properly, especially during sports. Injuries to these bones have become more common and may include stress fractures, softening of the cartilage, avascular necrosis, arthritis or complete fractures. These injuries may be debilitating, often affecting an athletic career of an individual. They also affect a person’s daily ability to weightbear. Injuries to these bones are usually caused by direct trauma (jumping and landing hard on the ball of the foot), from repetitive stress (stress fractures) or from hyperextending the big toe joint (turf toe). These injuries must be treated immediately. X-rays and MRIs may be necessary to evaluate the extent of the injury. Most of these injuries need to be completely rested in a cast or brace with crutches. When unresponsive to conservative care these injuries may be treated surgically to eliminate the pain and allow an athlete to return to sports. 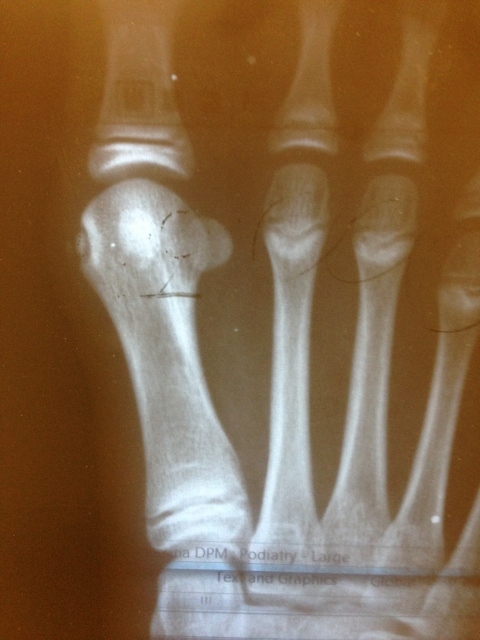 This is an x-ray of a dancer with an avulsion fracture of the MCL of the big toe joint (1st MPJ). The circular bone at the left of the bone is the fracture.